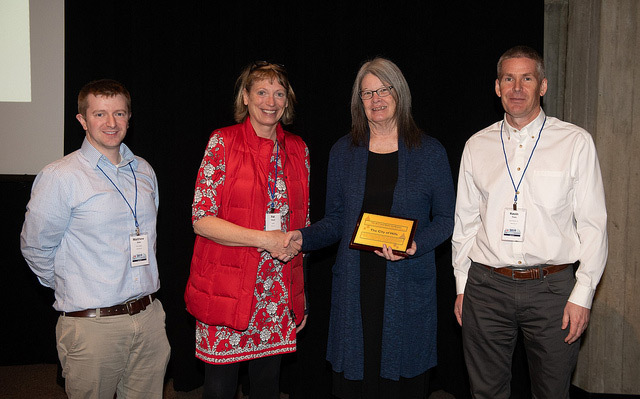 The Iowa Stormwater Education Partnership is pleased to announce that the City of Hills recently received a Stormwater and Urban Watershed Jurisdiction of the Year Award at the 2019 Iowa Water Conference in Ames. Cathy Fitzmaurice-Hill, City Administrator along with Matt Klein and Kevin Trom, Shive-Hattery accepted the award on behalf of the City. The award recognizes the City’s leadership role in implementing their first green infrastructure project that included permeable pavers in an upgraded downtown streetscape. They are also recognized for their partnership efforts with local businesses and commitment to long term maintenance of the practices. The Iowa Stormwater Education Partnership is a non-profit organization that supports municipal stormwater programs through the creation of educational resources and training programs.